Cheap Flights to Hong Kong. Return Flights. Hong Kong is a dynamic metropolitan area, with a unique culture blending touches of the East and West. 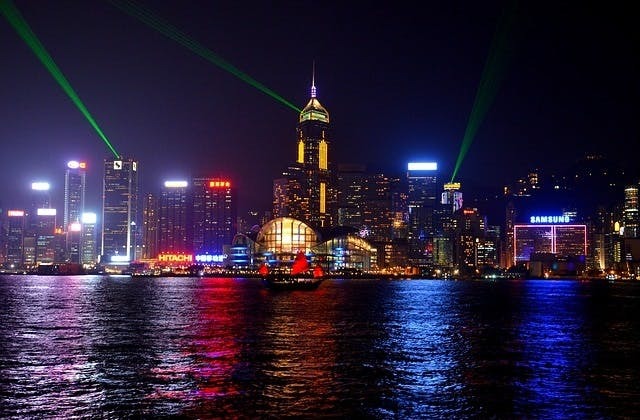 This incredible city offers a variety of one of a kind activities to experience, from dining on their traditional cuisine, exploring Victoria Harbor, and the Hong Kong Wetland Park, to visiting Hong Kong Disneyland or strolling the streets of downtown, there is something desirable for just about anyone, regardless of their background. Whether you're interested in learning of their unique and rich culture and what it is like to live in this beautiful city, or if you're looking for a luxurious escape from the states, you'll be sure to find something that fits exactly what you want on your vacation in Hong Kong. The cheapest flight to Hong Kong is $638 leaving from Adelaide on Virgin Australia. The nearest hotel to Hong Kong airport is The Regal Airport Hotel. The IATA airport code for Hong Kong is HKG. The nearest international airport to Hong Kong is Zhenzhen (Shenzhen) in China.